Facebook’s Free Basics and NYC’s LinkNYC both promised to bring Internet connectivity to the masses. So why was the community response to both so different? This piece is part of my series about how we can move toward humane tech. I love public infrastructure and I love the Internet. So efforts to bring free internet to people is possibly the most absorbing topic I can imagine. In the last few weeks, we’ve had some remarkably contrasting examples of the possible approaches to making internet connectivity more widely available. In addition to being important efforts on their own, two recent initiatives serve as compelling examples of who gets heard, and when, any time a big institution tries to create a technology infrastructure to serve millions of people. 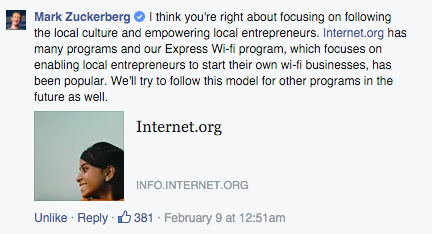 Free Basics is the name given to the effort from Facebook’s Internet.org to (ostensibly) get India’s poorest onto the Internet. As astute analyses have pointed out, the effort has largely not succeeded in those aims, instead mostly serving users who were already connected to the Internet. Recently, Free Basics faced its biggest challenge when Indian regulators largely shut down its ability to offer a service in India. It faced still headwinds right from the start, based on a broad set of technical and social objections. But the truth is, these problems and setbacks were not very surprising considering much of Internet.org’s efforts were created with a very Silicon Valley-centric mindset, and with the assumption that people would just accept a solution imagined on the other side of the world by people who weren’t from the communities being served. What’s more, it’s easy to forget that, beyond today’s immediate concerns about open access, colonialism was a reality in living memory in India — concerns about foreign corporate control aren’t some theoretical, abstract fear, but a real pressing issue that has impacted the lives of some of the people Free Basics is meant to serve. With all those legitimate objections, it’s no surprise that Free Basics has foundered, and that these rejections have caused its leaders to consider an approach that’s much more bottoms-up and community-led. The regulatory rejection inspired the expected “we’re disappointed, but will keep trying” response from Mark Zuckerberg. I wanted to use that as a starting point for encouraging a more community-led initiative. I was, frankly, heartened to see Zuckerberg adopt a thoughtful and open mindset, and it seems his recent willingness to really learn and be educated about issues continues. 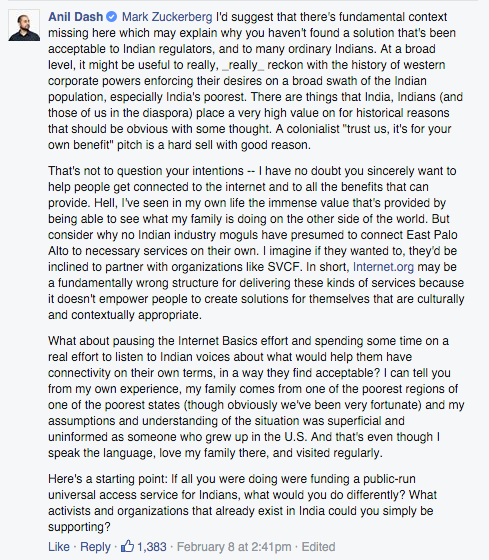 Of course, immediately after that promising reply, his board member Marc Andreessen publicly embraced colonialism in his response to the Free Basics rejection, and kneecapped the effort, perhaps for good. (The linked WSJ quotes Zuckerberg’s exchange above, as well.) We may never know how a more inclusive and thoughtful process would have turned out, but it still seemed like a promising course correction from one of the most powerful leaders in tech. Standing in stark contrast to Free Basics is LinkNYC, the recently-launched program to bring free broadband wifi to New York City. The initiative actually began in the public sector, as the Bloomberg administration launched a contest in 2012 to suggest innovative ways to reuse obsolete payphone infrastructure for something more modern. In the years since, the project has rolled along bringing in a striking mix of public, private and even academic participants. The job-profit NY Tech Meetup (where I serve on the board) hosted the Mayor’s rollout of the initial contest, and independent for-profit organizations competed to provide ideas. Now, a few years later we’ve seen the winning consortium, CityBridge, roll out a solution with Intersection, which is partially owned by Google’s Sidewalk Labs. That’s a lot of different stakeholders! But fortunately, they come from a broad set of constituencies across the city, and that breadth of influences helps explain why the initial version is a pretty good. Still, I had questions about whether the access points would be available to those who most need them. So I asked our mayor. And here’s the thing: Because the process of developing LinkNYC has been inclusive, community-driven and bottoms-up for most of its development, this answer seems credible to me. It’s not damage control being posted after the fact, it’s a response backed up by the community’s understanding of the history of the effort. I don’t worry that some board member (or city council member) is going to reveal their latent colonialist tendencies after the fact. That’s not to gloss over legitimate criticisms or concerns about LinkNYC — the Intersection team is still posting information about how to connect securely through the network, and there’s no doubt users will have questions about the privacy of their data on the network, especially given that the platform is advertising-supported. Yet we’ve got a precedent already that the community being served will be part of LinkNYC’s evolution going forward. There’s one key lesson we can take from these two attempts to connect millions of people to the Internet: it’s about building trust. Technology infrastructure can be good or bad, extractive or supportive, a lifeline or a raw deal. Objections to new infrastructure are often dismissed by the people pushing them, but people’s concerns are seldom simply about advertising or bring skeptical of corporations. There are often very good reasons to look a gift horse in the mouth. 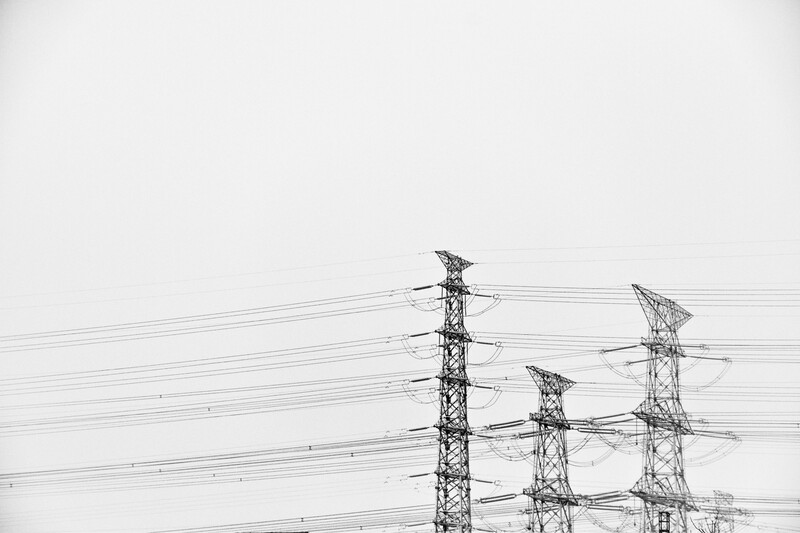 Whether we believe in the positive potential of getting connected simply boils down to whether we feel the people providing that infrastructure have truly listened to us. The good news is, we have clear examples of how to do exactly that. I’m the cofounder of Makerbase, a community for people who make apps and websites. Join us!